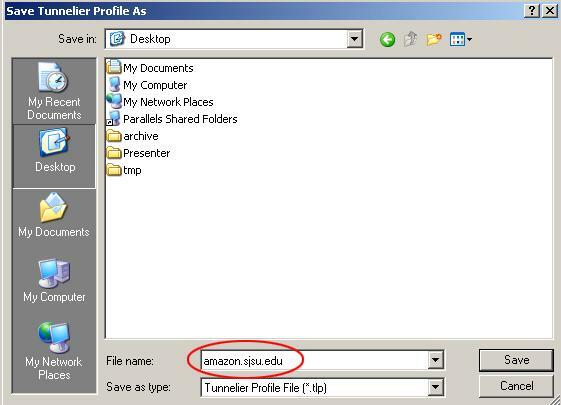 Once you publish your Adobe Presenter presentation, you will need to upload it to the iSchool Media Server (amazon.sjsu.edu). There are two methods for doing so: One is using an SFTP client, and the other is using the eXtplorer Web-based File Managment system. 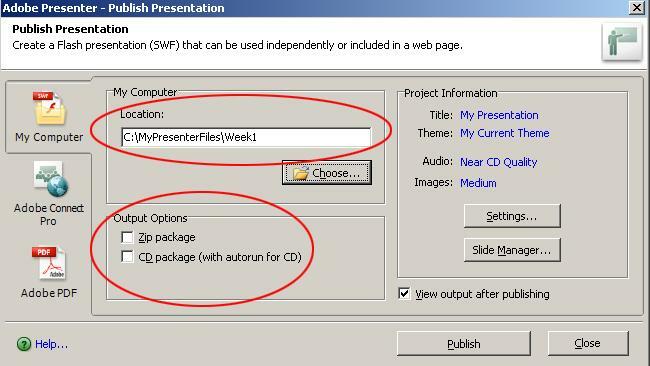 This tutorial will cover how to upload your Adobe Presenter presentation using an SFTP client. A tutorial on using the eXtplorer Web-based File Management system is available here. Contact Abigail Laufer and request an account on the iSchool Media Server (amazon.sjsu.edu). 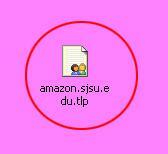 Also let her know that you will be uploading your files using SFTP. If you use a different SFTP program, then you may need to adapt the instructions slightly to suit your SFTP program. Note: We won’t actually be demonstrating how to install Bitvise Tunnelier. Basically, download the Tunnelier installer and then run the installer (double-click on Tunnelier-Inst.exe). The defaults should be fine for most people. If you run into any problems or questions when installing Tunnelier, please contact Abigail Laufer. 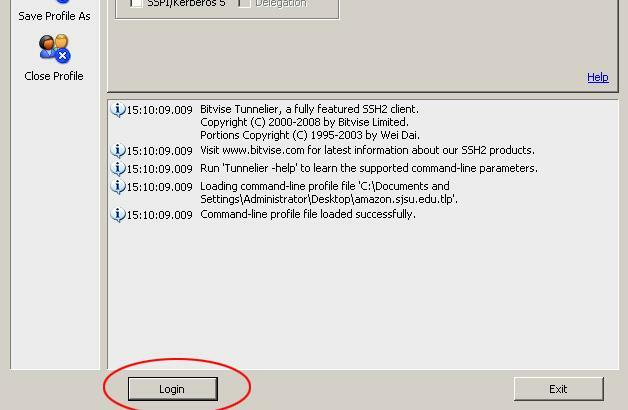 After receiving your amazon login information from Abigail Laufer, launch Bitvise Tunnelier and then proceed with the configuration steps included below. After launching Bitvise Tunnelier, you’ll see a number of configuration tabs. We’ll go through some of these tabs. 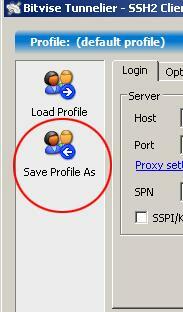 On the left-hand side, click on the button labeled “Save Profile As”. You’ll be saving your profile for quick access later. Browse to the location on your computer where you want to save your profile. Depending on how you work, you may want to consider saving your profile either to your desktop, or to My Documents. 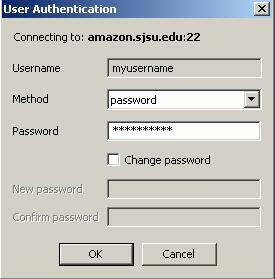 On the User Authentication screen, type in the password that was provided to you by Abigail Laufer. After logging in, you’ll see a screen similar to the one shown below. 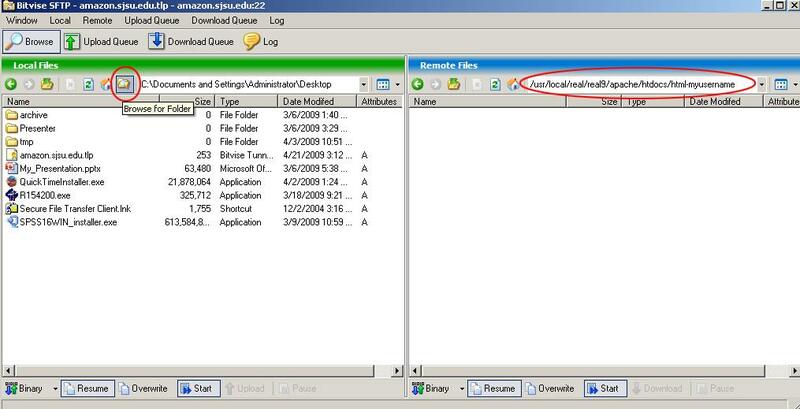 The left side (Local Files) allows you to navigate on your local computer, and the right side (Remote Files) allows you to navigate on the server. On the right side, you should see a directory named ”html-” and then your username. For instance, if your username were bobama, then the directory would be named html-bobama. Go ahead and double-click on the folder icon for your html directory. This will place you in your html directory. On the Browse for Folder screen, browse to the top-level folder that contains all of your Adobe Presenter presentations. In the following example, this is the folder named “MyPresenterFiles”. It’s important that you navigate to the top-level folder, instead of the actual subfolder containing the presentation that you want to upload. On the left-hand side, under Local Files, you should now see the folder containing the presentation that you want to upload. 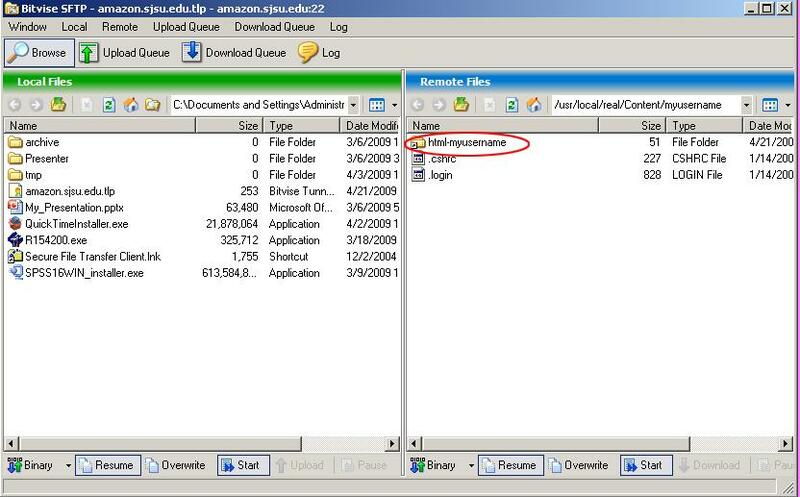 In this example, that folder was named “Week1″. ​Drag and Drop: On the left under Local Files, grab the folder with your mouse, drag it over to the right (remote) side, and drop it. This should initiate an upload of the folder. 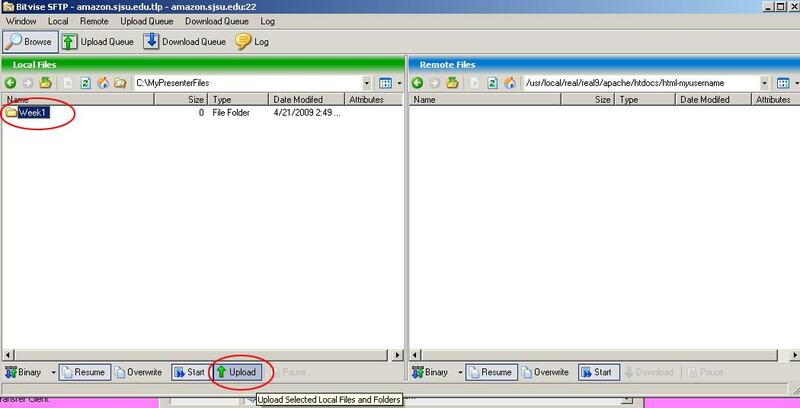 Final Method: Click once on the folder in order to select it, and then go to the “Local” menu at the top of the screen, and select the “Upload” menu option with the green up arrow. where “myusername” is replaced with your username, and “directoryname” is replaced with the name of the folder that you uploaded. The final step is to create a link in ANGEL to your presentation. Finally, click on the link in ANGEL and verify that your presentation launches and plays successfully.